Dried fruits such as walnuts are good for improving your memory and brain health. We all know the things that we should and shouldn't do to be healthy. For instance, it is a fact that we shouldn't be smoking to have our lungs in tiptop shape and most of us know that drinking at least two liters of water a day will have our kidneys working as they should. But do we know what to do - or in this case eat - to keep our brains sharp? Dietician and nutritionist Dilan Eker shared insights to a perfectly balanced diet with ingredients that will boost the performance of your memory and brain. Turmeric: With its active ingredient curcumin, turmeric is a strong yet natural antioxidant. This plant, which has been used for its medical benefits throughout history, helps your brain receive more oxygen, learn and process information easier. In order to activate the curcumin, turmeric has to be exposed to low heat inside olive oil. Seasoning your vegetables and meat with olive oil and turmeric is one of the ideal ways to add turmeric to your diet. 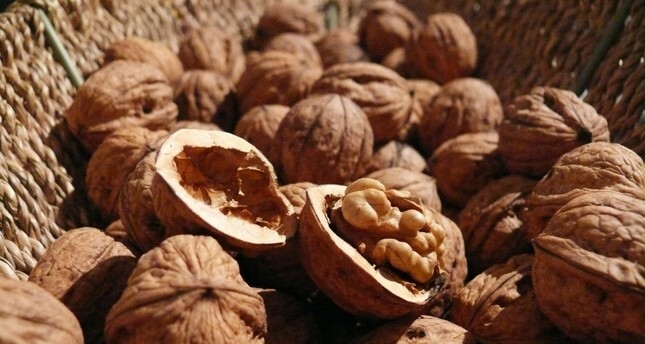 Seeds and dried nuts: Seeds rich in natural oils deserve their "brain-friendly" title fully. Walnuts, almonds, nuts, linseeds and black sesame are not only rich in healthy acids, antioxidants and minerals but also in vitamins, especially vitamin E.
Vitamin E protects cells from free radicals and slows cognitive decline. Although all seeds rich in natural oils and dried nuts are healthy, walnuts are one step ahead with their rich omega-3 ingredients. It is advised to consume a handful of these seeds and dried nuts every day to keep your brain sharp. Green leafed vegetables: Vegetables such as spinach, kale, broccoli, garden rocket, dill and parsley, which are rich in vitamins A and K, are not only key for healthy brains with their high antioxidant ingredients but also for the intestines. Also rich in vitamin C and fibers, green leafed vegetables help to protect the brain against any damage thanks to their anti-inflammatory features. A bowl of green leafed vegetables meets the daily need of vitamins C and K. It should not be forgotten that consuming these vegetables raw or half-cooked will eliminate vitamin loss. Blueberry: Just like other berries dark in color and green leafed vegetables, blueberries are rich in anti-inflammatory and antioxidant ingredients. Antioxidants slow brain aging and fight against oxidative stress which leads up to neurodegenerative diseases. Blueberries are especially proven to increase the signals between brain cells. Blueberries are also said to strengthen memory. "It is advised to consume dark colored berries in their season but you can also consume them frozen out of season and benefit from their antioxidants," Eker said. Cacao: Cacao and chocolate are known to increase the release of the serotonin hormone which is also known as the "happiness hormone." Cacao which is rich in flavonoids that boost cognitive functions helps strengthen memory and the brain's learning sections. Studies show that flavonoids in cacao slow down the cognitive deterioration that comes with age. To be able to benefit from these flavonoids, put down the regular milky chocolates that most consume regularly and choose bitter chocolate that contains at least 70 percent cacao. Fish: Known as the best sources for omega-3, fish is the best food to improve memory and strengthen the brain. Omega-3 acids boosts the signals sent by nerve cells and they help the brain communicate faster and better with other parts of the body. Moreover, omega-3 helps cognitive concentration. In order to receive enough omega-3, you should consume fish at least two or three times a week. It is always better to cook the fish on a low heat instead of frying. Egg yolk: Egg is a miraculous food that holds a great deal of nutrition good for the brain inside its shell. Egg yolk is rich in vitamin B, folic acid and choline, which are important nutrition for improving brain functions and regulating mood. Egg yolk stands out with its feature which helps to release the happiness hormone with its ingredient choline. Bone broth: Bone broth prepared with the right technique is known to boost the immune system as well as brain health. Commenting on the benefits of bone broth, nutritionist and dietitian Dilan Eker said, "Featuring collagen and hyaluronic acid, bone broth helps reduce oxidative stress and helps heal brain and connective tissue with proline and amino acids." By boiling bones for at least 12 hours, you can get a nice and healthy bone broth. You can also add some flavor by adding onions and garlic as well. Bone broth can be stored in the fridge for a week and up to three months in the freezer.